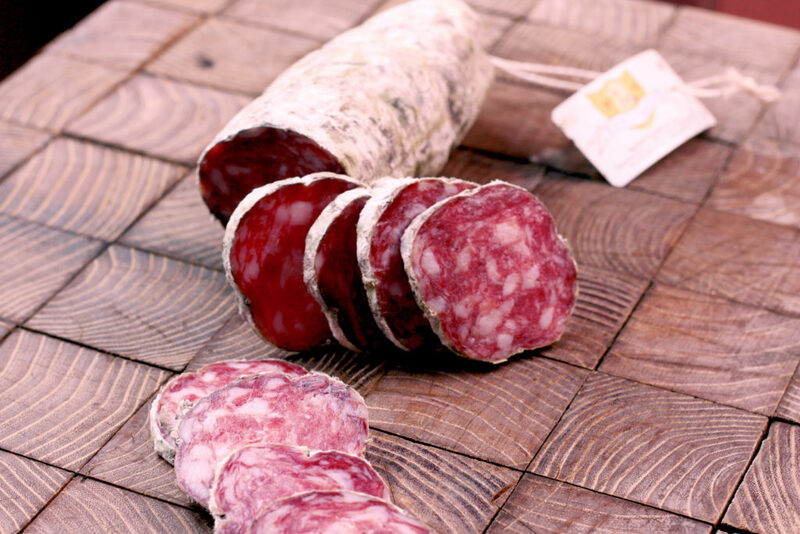 Brescia salami is one of the excellences of our food and wine culture. Meat processing and butchery recipe are handed down from generation to generation and from father to son. This is what has been for our family too, who jealously treasured the recipe. Selected meats, Terre di Franciacorta wine and our butchery knowledge make it a unique salami, hand-tied with the use of animal-derived bowel. Coarse-grained, its taste is traditional and its color is captivating. It goes well with homemade bread, polenta, medium-aged cheeses and still or semi-sparkling red wines. The aging, which takes place in our special rooms, has a duration ranging from 40 to 60 days. All cold cuts are hand-tied with the use of animal-derived bowels. All "Peruchetti Giuseppe & C." products are gluten, flour, milk powder and lactose free.